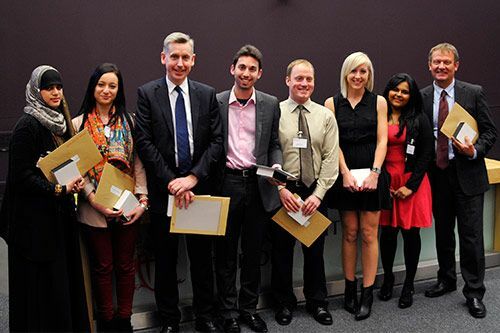 Outstanding students and alumni have been honoured at City University London's annual Student Impact Awards. The awards recognise the three strands of City's Student Development and Outreach programme: Widening Participation work with local schools, Community Volunteering and Professional Mentoring. "Outreach work with local schools, volunteering in the community and mentoring partnerships enhances the experience and increases the employability of our students. It also contributes a great deal the local community's experience of City University London. Our participating students are excellent ambassadors who we can be very proud of." More than 1000 students are involved in City's community volunteering scheme. This year's Volunteering Award for Leadership was presented to Sapna Chandaria (Economics). She supports blind and partially sighted people by completing applications on their behalf for the Royal National Institute of Blind People (RNIB). Laura Broad (Speech and Language Therapy) received the award for Widening Participation Ambassador of the Year after excelling across a range of events. The WP team host visits which allow young people to experience university first hand; provide maths support through the Primary School Partnership Scheme and offers tutoring and mentorship to help 10 to 18-year-olds achieve their academic potential. Now in its tenth year, the Professional Mentoring scheme provides the opportunity for students to work closely with successful professionals who are often City alumni. The prize for Mentee of the Year was given to Hassina Amiri (Civil Engineering) whose mentor described her as 'clever and dynamic'. The professional mentors who offer their time to students at City were also honoured at the event. Civil Engineering alumnus Anthony Rimoldi was named Mentor of the Year. Now Chief Executive of the asset maintenance contractor Concrete Repairs Limited, his mentee's nomination attested: 'Anthony has absolutely changed my life within a few months'. "This event is a fantastic opportunity to recognise students' personal development and the work that they have done to support the community, as well as celebrating the professional mentors who give a great deal of their time to help enhance our students' employability." "They volunteer twice a week for Help on your Doorstep, offering help to residents of social housing estates. This person is a bright, hardworking part of the team". "This individual has shown unswerving commitment to promoting volunteering at every stage of their student journey." "She puts young people at ease right from the minute she introduces herself "
"He puts a lot of preparation into his sessions, thinks carefully about how to engage the pupils, and keeps us fully informed of their progress." "This person has gone the 'extra mile' since the day we met, when they set out to make me a better person and told me that everything is possible." "They were highly ambitious but without enough hard work being put in to support these goals. They have now become a very productive person". More information about volunteering, mentoring and widening participation can be found on the City website.